Artist Cindy Sharpe has made a name for herself in Memphis with her work on the Vietnam War Memorial, the Peabody Hotel and many restaurants. Sharpe, a native of Memphis, received her B.F.A in sculpture from Memphis College of Art in 1982. Shortly after completing her B.F.A, the company Sharpe was working for, Bensinger’s Glass, was contracted to do the Vietnam War Memorial. The project was very elaborate, Sharpe along with other artists were required to etch more than 58,000 names into the stones of the memorial. There is still a strong demand for old world skills like glass work which is what made Sharpe decide to open her own business. In 1986 she opened Carved Designs on S. Cooper St. in which provides custom glass designs and restoration needs for residential and commercial buildings. 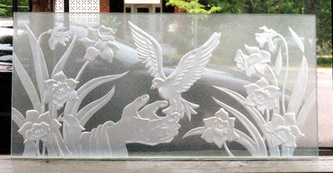 Carved Designs has done glass work for numerous churches, hospitals, restaurants and private homes around Memphis. Sharpe has seen a spike in private contracts due to her extensive restoration on the houses and buildings in the Cooper-Young and Midtown areas of Memphis. “Many people who buy houses in these areas want to restore the houses back to the way they originally looked,” said Sharpe. Church officials often contact Sharpe for restoration work on their stained glass windows. One of the more recent churches she worked on was Kingsway Christian Church in Germantown. Sharpe also created the etched glass pieces for the set of The People vs. Larry Flynt and did the glass dividers at the restaurant Erling Jensen. 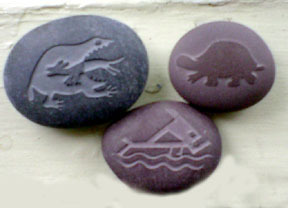 Though Sharpe enjoys doing large scale projects she also sells little gifts and makes customized awards and signs. Felicia Pisarz covers arts and the antique district for MicroMemphis. Follow her on Twitter @fpisarz.